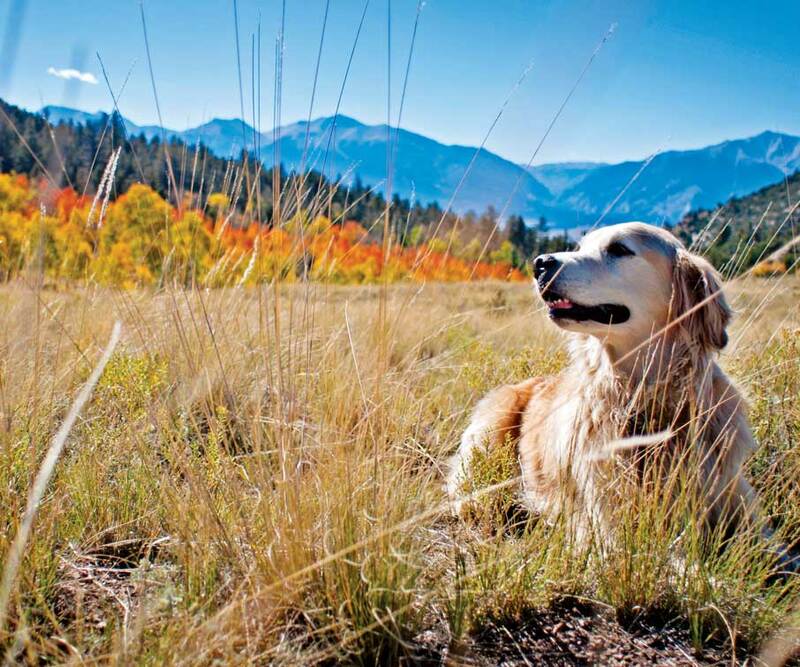 Dogs make the world a better place, and canine-friendly trails all across Colorado make it easy to discover our natural riches with your loyal sidekick. Fall is a particularly special time for hiking — when the weather is cooler and alpine vistas are accented with eye-popping color. What’s in it for you and your pooch: plenty of exercise, prized quality time together and unlimited photo ops. Win-win-win. Experience the golden season at its best from the shores of 325-acre Silver Jack Reservoir, where you can see the spikey spires of the San Juan Mountains play peekaboo with forests accented with ribbons of burnt orange and daffodil yellow. Follow the road past the Uncom­pahgre National Forest/Silver Jack fishing access sign to get to the trailhead and parking lot. Pups aren’t allowed in the water but are often spotted roaming freely along the trails. The star of Rifle Falls State Park is undoubtedly the falls, a triple cascade surrounded by moss-cloaked rocks and a canopy of deciduous beauties that become splashed with gold during the color change. Dogs are welcome on all of the park’s trails (but not in the adjacent wildlife area), but the Coyote Trail offers nice sights of the falls and unique access to the limestone caves — interesting for you to check out with a flashlight and great sniffing grounds for your companion. While several trails at Golden Gate Canyon State Park lead to Frazer Meadows — known for its swoon-worthy autumn panoramas — the Mule Deer Trail receives less traffic, giving you and your four-legged buddy a little more solitude. Start at the Ole’ Barn Knoll trailhead and meander through aspen groves, sprawling meadows (a great place to gawk at wildflowers in the summertime) and evergreen woodlands. Looking for a shorter route to Frazer Meadows? Try the Horseshoe Trail, which will get you to leafy splendor in less than 2 miles. Named for rock formations that resemble stacks of hot cakes that dot the landscape (the perfect inspiration for your après-hike meal), this Colorado Springs-area route travels through forests populated with fragrant pines and sunny-colored quaking aspens and an open field with a little creek. Prepared to be wowed by the view at the trail’s climax of Pikes Peak and the surrounding Rocky Mountains, and keep an eye out for ancient bristlecone pines. This portion of the East Lake Creek Trail traverses dense forests in northwest Colorado’s Holy Cross Wilderness and is a fall fav with locals who like to hike with furry offspring in tow (kiddos are also welcome, of course). Find serenity amid the bounty of imposing white-barked trees, whose leaves resemble a gilded ceiling when a breeze shuffles through. Turn around at the 2.5-mile halfway point at the wooden bridge, or keep going — the trail continues for another 10 miles. The first couple miles of this out-and-back route are touted to be a walk in the park, but the last 1 to 2 miles contain sharp switchbacks. But the payoff is big: Cirque Lake and its equally attractive big sis — Emmaline Lake — are gorgeous framed with a mix of forever green and varied fiery hues. The Emmaline Lake/ Mummy Pass trailhead is located on a dirt road just past Tom Bennett Campground. Named for a Forest Service recreation manager who designed the trail in the mid-1980s but passed away before it was completed, this trail offers wraparound views of Telluride, including the ski resort, Bridal Veil Falls and glowing aspen groves. The elevation gain is about 1,300 feet, and there are several streams for dogs to dip their paws into. To get to the trailhead, walk to the top of North Aspen Street and cross the bridge on the left. A bucket-list item for many Coloradans, the journey between Aspen and Crested Butte offers off-the-charts views of the Elk Mountains punctuated with swaths of golden aspens and verdant pines. But you’ll have to work for ’em. The climb to the West Maroon Pass’ summit includes a 3,000-foot elevation gain, but the final 4-mile descent to Crested Butte is downhill (thank goodness) and takes ramblers through woodlands dense with reds and golds. Find the trailhead at the Maroon Bells, where selfies of you and pooch in front of the most-photographed scene in North America are a must. Smart hikers (that’s you!) pick up after their pets — because nothing ruins a day on the trail like stepping on a pile of forgotten doggie treasures. Difficult trails that in­clude steep vertical climbs, traversing long distances and/or substantial ele­vation gains should only be pursued by experienced dog-and-human hiking duos. Dress in layers for our famously unpredict­able weather, follow leash laws where indicated and carry plenty of water for you both. Trees that dwell at higher elevations must prepare for winter weather earlier, so they’re naturally programmed to develop autumn colors before their leafy friends at lower elevations. September is typically an ideal time to witness striking transformations on the trails. One strategy: Select your travel dates in advance, but not your destination. Then go wherever the color is.